Choosing bathroom flooring is far different from choosing flooring in other parts of the house. Once you get past commonalities such as durability, looks, and cost, you have to confront one factor that is found in no other area except the basement: large quantities of water. Porcelain tile is the best of all worlds for bathroom flooring, as it is waterproof, stylish, and cost-effective. Like stone, porcelain tile can achieve a rich, textured, solid feeling. Like vinyl, it is waterproof and is fairly inexpensive. Like wood flooring, it looks great. But should you choose porcelain or ceramic tile? Porcelain is part of the ceramic tile family with one slight difference: water absorption rate. The Porcelain Tile Certification Agency (PTCA) certifies types of tile as "porcelain" if they have a water absorption rate of 0.5% or less. If this is a half bathroom or powder room, there is less of a need to purchase porcelain tiles because there are no bathing facilities. Because there are so many different types of ceramic tiles, you can create the exact floor you want. You can even find ceramic tile that looks like wood or stone. Individual tile comes in a wide variety of size and shapes, from square and rectangular to octagonal and hexagonal. Smaller mosaic tiles are pre-mounted on plastic mesh sheets, so you do not have to individually set each tile. With tinted grout, you can be even more creative. Best of all, tile cleans up well and bravely resists even standing pools of water. Like stone, tile is cold. However, radiant or heated tile can be laid under the tile. With reasonable good looks and supreme practicality, vinyl has been a popular choice for bathroom flooring for decades. Sheet vinyl flooring is your best option if extreme amounts of water are expected, such as in children's bathrooms or laundry rooms. Because it comes in large sizes, sheet vinyl may have as few as zero seams in a small bathroom. Luxury vinyl plank flooring, an increasingly popular choice, comes in narrow widths (about 5 inches) and long lengths (up to 48 inches). Most vinyl flooring is very much a do-it-yourself job. Because vinyl is so popular, there are thousands of style options available. Gapped and poorly laid seams are floor killers. Vinyl flooring is only as good as its seams. Sheet vinyl is difficult for the do-it-yourselfer to install. 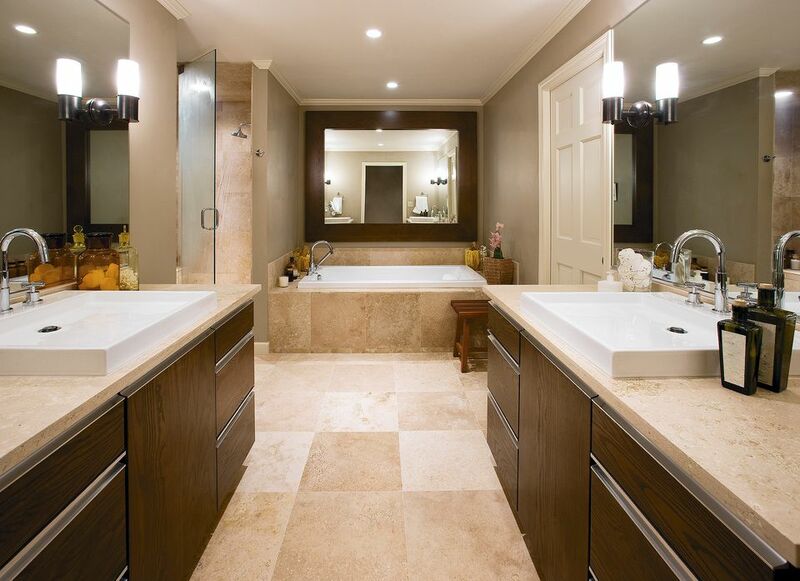 Natural stone is a good choice for bathroom, but only if you can afford it. There are few moisture problems with marble, granite, limestone, and the other stone flooring options. Natural stone is hard, durable, and aesthetically pleasing. Stone flooring returns excellent resale value. Engineered wood has a plywood base that holds up well against moisture. And it looks authentically like wood because the top layer is real wood. If you wish to have natural wood in a bathroom, engineered wood is the best choice. Any type of wood product, no matter how well protected, is prone to damage in bathrooms. Surprisingly, laminate flooring is a better bathroom flooring choice than solid hardwood. Laminate flooring is no more than resin-impregnated paper atop a wood chip base. The surface of laminate plank is actually a photograph of oak, cherry, slate, marble, or any other wood or stone. On top is a clear coat called the wear layer, which is amazingly strong. DuPont RealTouch, for instance, warrants the wear layer on its line of laminate flooring for 30 years. Laminate can work in bathrooms if you take precautions to protect the wood base from moisture. With tight seams between the planks, it is difficult for moisture to work its way downward. Laminate is easy to clean, too. But laminate still has that wood chip base. Should it happen to have contact with moisture, it will expand and bubble, and the only way to fix it is to tear it out. Truly waterproof laminate flooring is an idea that has not yet come to fruition even though several manufacturers have tried. Carpeting: Because carpeting retains moisture for so long, it tends to dry out slowly within the confined spaces of bathrooms. This makes carpet a poor flooring choice for bathrooms. However, if you do wish to have carpet in the bathroom, make sure the pile is low and the material is 100% inorganic, such as olefin or nylon. Solid Hardwood: Except for its top coating, solid hardwood has no protection against moisture. Even the smallest amount of moisture that works its way into the wood will eventually rot it out. Only slightly better than carpet, solid hardwood looks great and feels warm under foot. If you absolutely do want solid hardwood in your bathroom, make certain it is perfectly installed, with zero gaps for moisture. This means professional hiring installers. It also means site-finishing your hardwood. Doing so floods the seams between the boards with coating, effectively blocking moisture migration from the top side. Wood in Your Bathroom? Yes, You Can!